We rent moonwlaks, slides, combos, onstacle courses, games, concession items and much much more. THE BOUNCE HOUSE THEMED SPECIALIST OF PARK RIDGE AND ELMHURST. BROWSE OUR WEBSITE AND START YOUR THEMED BOUNCE HOUSE EVENT THE RIGHT WAY. Serving N-NW-W Chicago suburbs & Northern Chicago area. 40+ Inflatables available. SEE WEBSITE FOR PICTURES & PRICES. Dunk Tanks, Trackless Train, Balloon Twisting, D.J. also available. Inflatable Bouncers for Rent Call for special pricing! Our goal is to make your child's party the best that it can be. We are your one stop shop for all your party rental and entertainment needs. We have moonwalks, tents, tables, chairs, carnival games, concessions, and casino equipment. Castle Party Rentals & Entertainment offers party equipment such as inflatales, games, rides, concessions, tents, tables, chairs, as well as entertainment such as clowns and dj. We provide clean, sanitized, safe units. Jumpers, Moonwalks, Waterslides & Combos. Frozen drink machine, Popcorn, Cotton candy, Snowcone, Nachos, Hotdog Grill. Party favors. Fun 4 U Inflatables, Inc. Licensed Disney Moonjumps. Our Large moonwalk offers a generous jumping area (15x15). Our Moonwalks are Cleaned and Sanitized after each use. we offer service with a smile and free set up and take down of all bounce houses. Visit today! We provide colorful unique inflatables for all occasions. We offer different styles of moonwalks, slides, games, and concessions for any type of event. We provide excellent service, our rates are very affordable and are fully insured. We offer both an Indoor Birthday Party center as well as a huge selection of outdoor bouncers, for any event. Discounts for muitiple unit rentals! The nation's #1 inflatable rental company! We have one of the largest rental inventories in the nation, with thousands of inflatables available for rent, helping your party or event be a huge success! America's Leading Provider of Inflatable FUN! We rent Space Walks, Big Inflatables, Water Fun, & Concessions. Chicago Party Rental, Photo Booth, Mechanical Bull, Green Screen, Arcade Games, Inflatables, Rock Climbing Wall, Company Picnics, Obstacle Courses, Team Building, School Carnival, Game Shows and more. Providing moonwalks, interactive games, carnival games, concessions, dunk tanks, tables, chairs, water slides, slip n slides and more. Add a Illinois Bouncy Business! Advertise a Illinois bounce house business in this inflatable rentals resource and have your Illinois inflatables business information appear across multiple Children's Party and Kids Event rental websites. Bounce House Guide is the most complete online resource of Illinois Bounce House Rental information. Find a Illinois Bounce House For Rent, Themed Bounce Houses, search for Moonwalks, Jumping Castles, Illinois Inflatables, Obstacle Courses, Sumo Suits, Bungy Trampolines, Jousting, Illinois Giant Slides, Water Slides, Party Rentals, Carnival Games, Concessions, Fun Food, Dunk Tanks, Table and Chair Rentals, Photo Booths, Illinois Festival Rentals, Illinois Event Rentals, and more! Do you own a Illinois Air Jump Business? We also feature HOT ways to advertise and market your Illinois Bouncey House Business. Add a Illinois Bounce House Business or take advantage of our Premium Bounce Advertising & Featured Listings. Buy or Sell Equipment in the Inflatables Classifieds. 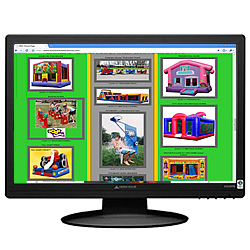 Promote your Illinois inflatable business with Air Jump Marketing Products, browse the Bounce House Blog, follow Bounce House Social Media on facebook Air Jump Rentals or twitter Air Jump Rentals, discover multi-site marketing with the Kids Party Resource Network, or Advertise a Illinois Bounce House Business For Sale.